I’m pretty sure at this a point the NYPD has just called it a day. Seriously, how do they get any real police work done? Do they have a code for “screw it, superheroes are involved”? I kinda want to read that comic. Anyway, Kamala is safe, apparently her abilities offers some extra benefits of not transferring over wounds. 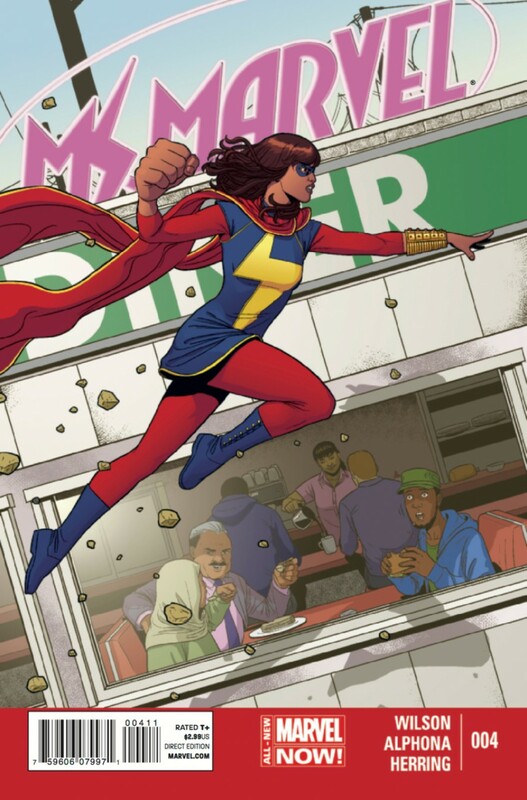 I wonder if this means if she’s hurt as Kamala she can turn into Carol and be okay? It’s something we might find out later, I hope. Kamala didn’t quite learn her lesson though and is getting herself in over her head again. But her heart is totally in the right place. She has a hero’s gumption, she just needs to work on her tactics and planning. She’s growing as a character already and that’s wonderful to see. The title also isn’t relying on undue angst and torment so it is genuinely entertaining. So far this title has been a throwback to the classics but maintains a very modern feel. It proves why a lot of the current tropes just don’t work anymore. Right now, I’m gonna say this is Marvel’s best title. If you’re not reading it… you might want to fix that.